Recently a new project “HeiMAP” has been funded at Heidelberg University. The goal of HeiMAP is the development of an online research platform with modular tools and services for project and data management especially for the collaborative work with and on predominantly historical maps and geographic information in the humanities. Maps contain multiple layers of information about past and contemporary geographies. To make scientific use of the embedded geographic information interdisciplinary collaborative work with high demands on internal communication, efficiency and interdisciplinary multimedia data management are required. The envisioned virtual research environment shall allow researchers from the humanities to work on digitized (historical) maps and spatial data. It shall provide the possibility to find solutions for a number of urgent problems in humanities research questions using geographical information: orientation in pre-modern space through exploitation of historical maps, active research on maps, working together online instead of working with desktop applications with high entry barriers and accessibility. By focusing on core functions and target group-oriented documentation, close connection with the services of the university library, rights management and proof of provenance, standard compliance of the developed geodata by assisted data modeling, long-term storage, propagation and reimportation of records with respect to new questions. The core of the project is a web-based Geographic Information System (WebGIS). The modular design of the system and compliance with international standards ensure a flexible connection to a web portal, which connects several tools and services, such as database systems for storing the metadata (with interfaces to external databases), various communication and organization tools, a central data store, a forum and various project managemenent tools. The inter-site and secure use of all tools is guaranteed by the identity management from bwIDM. 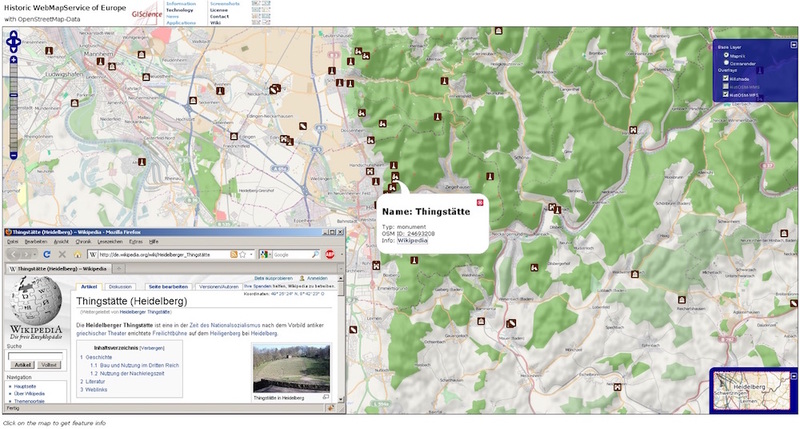 The GIS module is connected to the Heidelberg research data repository heiDATA, whereby the publication of scientific data can be done (with DOI), thus improving the reuse possibilities of scientific results.